Linked to the hilarious BBC2 series. Round the bend and over the edge – how far will you go to be a perfect parent? Does an impending child's birthday party fill you with performance anxiety? Did you spend more time on your child's homework last night than on your own employer's end–of–year report? Do you drop boastful hints about your child, saying 'George is so "busy"' – even though George is six? If so, you might be suffering from the madness of modern families. 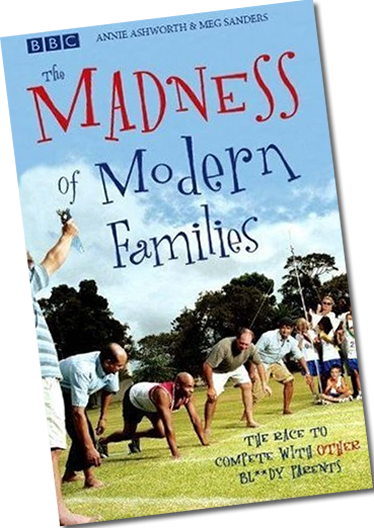 This book is a hilarious insight into the modern rat race that modern middle–class family life seems to demand. It asks, why have we acquired the skills of a black cab driver as we ferry our children from Monkey Music bassoon lessons to advanced trapeze? And why do four different children now require four different kids of pasta – leaving aside the pressure of children's birthday parties and the need to provide organic veggie Halal birthday cakes?